The Butchart Gardens - one of Victoria's most famous and popular attractions! Begun in 1904 as an effort to restore a worked-out quarry site, The Butchart Gardens has since been delighting visitors from all around the world. As you make your way around the gardens, you'll walk through intimate stone paths and streams lined with colorful arrays of flowers and trees. The gardens adjusts their floral displays to suit the season so it is just as spectacular in Spring and Fall as it is in Summer. 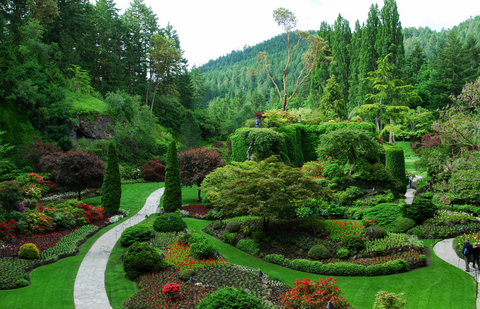 The Butchart Gardens has been designed to please the eye and generally delight the senses. It could be the pale green of emerging leaves in spring, complemented by brilliant pink or white flowers of trees; the dazzling bedding plants framed in by sweeping lawns, with the treat to the nose of a waft of a thousand scents of summer. Approximately 35 minutes from downtown, The Butchart Gardens features over 55 acres of meticulously manicured grounds. Blossoms, fragrances and during the summer, the Night Illuminations, ensure that this will be an experience you will not soon forget. Your bus ride is fully narrated by the driver, sit back and relax while you hear about the past, present & future of Victoria and surrounding area. This tour gives you the freedom to stay as long as you would like at the gardens. When you are ready to leave and visit Downtown Victoria, you may choose one of several departure times.